Believe it or not, heavy-duty trucks play in a highly competitive segment with businesses and tradesmen looking to buy the best truck with the highest towing and hauling capacities while still being coddled in a comfortable and stylish cabin full of useful technology. Though it’s highly competitive, there are only three true players: the Chevrolet 3500, the Ford F-450/F-550 and the Ram 4500/5500. Each truck has its strong suits and all do a darn good job of moving heavy stuff around, but the current standout in the segment is indubitably the Ram. Offering more options and ways to customize its trucks, the Ram caters more to those looking to build the exact truck to fit a specialized need. Power comes from two iconic names in the industry, HEMI and Cummins. HEMI might be more associated with the high-horsepower performance crowd, but Chrysler’s 6.4-liter HEMI as recently made its appearance in the heavy-duty truck segment. It’s high torque output combined with its variable valve timing and cylinder deactivation make it a great alternative to the more expensive diesel. However, when the loads are heavy, the Cummins is the engine to have. 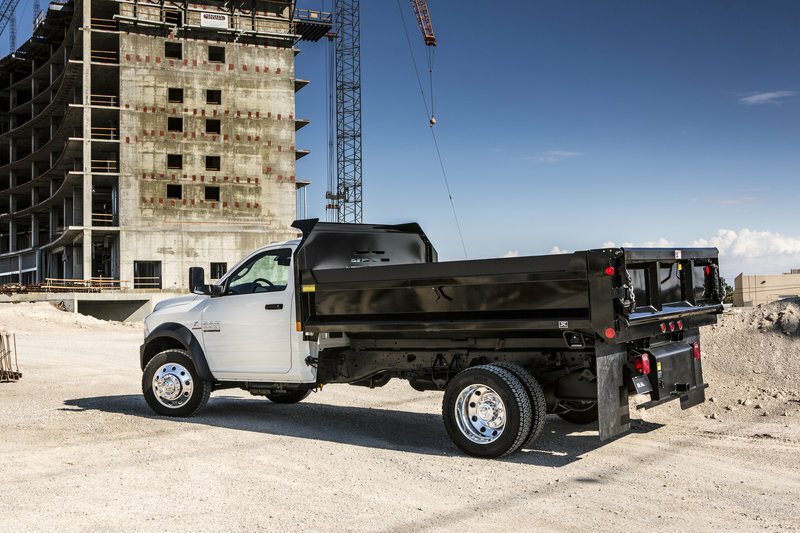 Generating an enormous 750 pound-feet of torque, the Ram 5500 can pull a massive 29,600-pound trailer with ease. Moving heavy stuff around is important, but getting people to and from the job site is equally so. The Ram Chassis Cab’s interior is a basic carbon copy of the near-luxurious cabin of the Ram 1500, 2500, and 3500 trucks. Uconnect, a 7-inch TFT display, and navigation are just a few amenities the Ram boasts – and they can be had inside a truck that’s fitted with a dump bed.